As its name suggests, fried ravioli are essentially breaded, deep-fried versions of the popular filled pasta that make a fun appetizer. 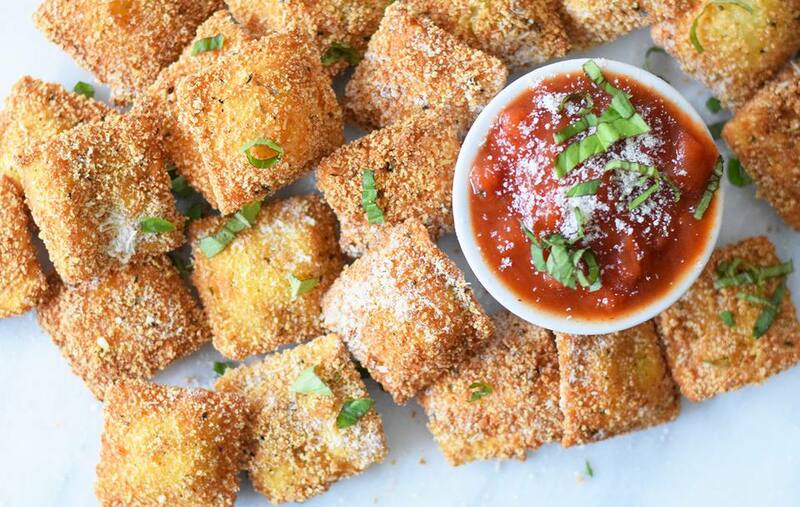 To serve, they're sprinkled with Parmesan cheese, basil, and dipped in a tasty marinara sauce. Four-cheese ravioli works best in this recipe because they have the most flavor. Plain cheese ravioli don't pack as much of a punch and get a little lost in the breading. You can also use other types of premade ravioli that have stronger fillings like a prosciutto or mushroom. Combine the salt and pepper with the flour in a shallow dish. Set up a breading station. This dish will be the first dish in the sequence. Next, whisk together the eggs with the whole milk in a separate shallow dish. Place this dish as the second step in the breading station. Finally, mix together the bread crumbs and Parmesan cheese in a third shallow dish. This will be the last step in the breading sequence. Heat the oil in a heavy bottomed pot to 375 F. You can monitor the temperature using a frying or candy thermometer. Check the temperature as you are frying to maintain this temperature. Turn the heat up or down depending on the temperature. Dip the ravioli in the flour, coating both sides of the pasta. Next, cover the ravioli in the egg wash, coating the ravioli completely. Finally, roll the ravioli in the seasoned bread crumbs. Place the completed ravioli on a baking sheet or plate until the oil is ready for frying. Fry 4 to 5 ravioli at a time for about 1 minute per side or until golden brown on both sides. Remove from the oil and allow them to drain on a paper towel-lined baking sheet. Keep frying the ravioli in batches. Keep the completed ravioli hot in a 250 F oven while you complete frying. Once you are ready to serve, heat the marinara sauce until warmed through. Place the sauce in a serving dish. Sprinkle the ravioli with grated Parmesan cheese and shredded basil leaves. Serve warm with the marinara sauce and enjoy! Fried ravioli are super easy to whip together ahead of time and fry up for a party. Just follow all of the breading steps and place them in the refrigerator or freezer overnight. Take them out right before you are ready to fry the next day. Besides the breading, they don't require any prep as you can buy the ravioli premade at the store. Frozen ravioli can work for this recipe too, but the kind you find in the refrigerated deli section of the grocery store work the best. Make sure to thaw frozen ones in the refrigerator before you are ready to bread and fry them.